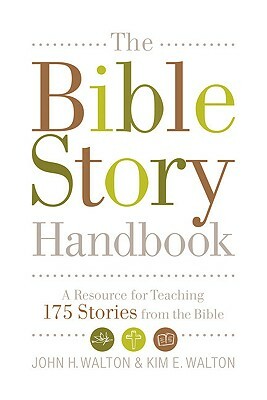 The Bible Story Handbook : A Resource for Teaching 175 Stories from the Bible is a relatively new release from Crossway Books. It is, as it says, a resource book. It caught my attention primarily because we're "in the zone" of telling Bible stories to our children and I love making good use of good resources. Coming from Crossway, I figured this was a safe bet. Authors John H. Walton & Kim E. Walton put together this resource to aid in teaching children to know God through the stories. In the (lengthy) introduction - Why Do We Teach Bible Stories? - they discuss the fact that Bible stories and curriculum today focus primarily on teaching facts or drawing personal applications frequently unrelated to God and His character. This concerned them enough that they wanted to put this book together. Mostly, the authors are addressing Sunday School teachers and pastors in this book, assuming that they will be the primary audience. That may be true but I find it equally helpful as a parent as parents are the ones who front the large majority of their children's questions. The Waltons aren't all together slamming the use of curriculum in Sunday School classrooms, but they are cautioning total reliance on it and using it just because that is "what is always done." They challenge the teachers to focus more on scriptures and less on prepared papers that tend to ignore discussions of the greatness of God, instead focusing on things like friendship, learning about the world around you, etc. I did appreciate several of the author's statements that they make in their introduction. Instead of explaining them myself, I'll just use quotes. I think The Bible Story Handbook is an interesting and useful tool and I would be curious to see what would happen if some churches would pick it up and discuss it with their staff and Sunday School teachers. I wonder how much it would revolutionize and change Sunday School programs. (And I also wonder how much it would have to, in particular churches.) In the meantime, as a parent, I find it useful and helpful in continuing to answer questions for my children. Thanks, Crossway Books, for sending a copy of this my way to check out! I like your reviews. You make me consider things that I hadn't always examined thoroughly. This is why my parents years ago switched to reading the Bible out loud to us kids every night at dinner instead of some devotional. (Even toddlers had to listen!) There is nothing beter than the real thing. I think I had the entire Bible read to me 3-4 times by the time I left home. I'm pretty opinionated when it comes to Biblical teaching and "verse plucking". I so appreciate our church's approach of (generally) avoiding topical teaching and using a book by book method instead. Amen on the "fantastic quote". I wish more churches would see that and instead of trying to be popular. Sounds like a great resource, and a good reminder of the focus we need to have in teaching the Bible. Interesting. A few years ago my church switched to writing our own curriculum. It's a 6-year study from Genesis to Revelation (though we haven't hit on every book) that studies the theme of redemption throughout. We've finally made it to the New Testament, and it's exciting to be able to draw so heavily on the Old Testament, because we've studied it together (everyone 4-year-olds on up is on the same passage). I'll have to see if I can find that. It looks really interesting. This title is new to me, but years ago I took an undergrad class with Dr Walton on Interpreting the Psalms, and I think he totally knows his stuff when it comes to contextualization, interpretation, and OT and Ancient Near East history. His other books/textbooks are awesome and very eye-opening. Love that he is applying this specialty to teachers of younger students (whether home, church, or school). Glad you found his work helpful! Ronnica- I think that's a fabulous idea! What if more church would think to do that? I think the Bible is plenty relevant and the earlier children learn that the more profitable. Love that idea. Mindy W. - Thanks for sharing your insights and experiences there! That's really neat to hear about. I'd be interested in anything you find that facilitates developing a relationship with God, rather than knowing facts about God. This is my challenge. Most of the educated people I know are informed about scripture. They just don't believe that they are obliged to make the Judeo-Christian God Lord of their lives. Sounds interesting. We do a three year rotation, roughly a year Old Testament, a year New Testament and a year of catechism. As the kids move through the age groups they repeat the rotation but at a higher level each time. Sort of like the homeschooling classical education model. were perfect people but because they were chosen by God. As the kids get older we use the flaws of the people in the Bible to again demonstrate God's grace and our redemption rather than a "be like so and so" approach. This sounds like a wonderful book--one that addresses my pet peeves in Sunday school curricula. It drives me nuts that so many students see the point of the Bible as "be a better person" rather than recognizing the grand story that reveals Christ, our need for Him, and the way He made to fulfill that need. I've had this sitting on my shelf for a couple of months and had my review mostly planned out in my head, but haven't actually written it yet. :-) I love the approach...this is how we try to do it with our kids and it's so nice to have this as a resource!